This broad-bodied leaf beetle is relatively small for a beetle but relatively large for a leaf beetle. Adults are ¼″ to 7 ⁄16″ long and about ⅛″ wide. The body is oval when viewed from above (dorsally) and strongly convex when viewed from the side (laterally). The hardened plate on the upper side of the thorax (pronotum) is orangish-yellow to yellowish-brown and three times as wide as long, nearly as wide as the base of the hardened forewings (elytra). The are two black longitudinal marks in the middle that often join to form a V-shape, and several smaller black spots on each side. The elytra are long and cover the tip of the abdomen. They are pale yellow with a black inner margin and five black longitudinal lines on each side. The	small	triangular	plate	at	the	base of the elytra (scutellum) is black. The head is yellowish-brown with a small triangular black mark in the middle. It is partially visible when viewed from above. The antennae are short, less than half as long as the body, and widely separated at the base. They are weakly clubbed (clavate), gradually enlarged as they approach the tip. The eyes are black and are not notched. The legs are mostly yellowish-brown. The last part of each leg (tarsus), corresponding to the foot, is black and has five segments. The fourth segment is very short and is concealed within the broadened tip of the third segment, making the tarsus appear to have only four segments. The larva is very plump, strongly convex, and brick red when young, becoming pink and finally orange as it ages. It is about ½″ long when mature. It has two rows of black spots on each side, a black head, and six black legs. Larvae are found on the same species that adults feed on. Leaves of mostly potato but also other plants in the Solanum genus. The female deposits masses of usually 20 to 60 bright orange eggs on the lower surface of leaves of host plants. After hatching the larvae pass through five distinct stages (instars). Mature larvae burrow ¾″ to 2″ into the soil to pupate. Adults of the second generation burrow shallowly into the soil to overwinter. 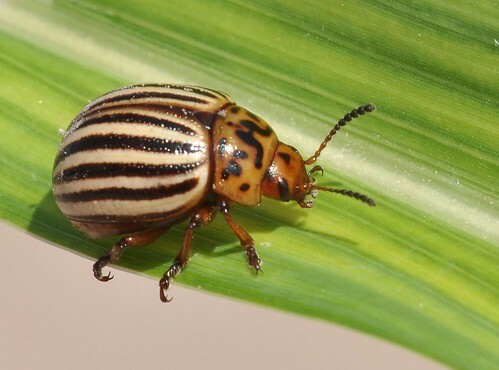 Prior to European settlement the Colorado potato beetle was found only in Colorado and neighboring states. The potato was introduced into North America in the 1600s and began to be widely grown in the early 1700s. By 1840 the potato reached the insects home range. By 1859 the insect had switched to the potato as its preferred host, and by 1874 it had spread all the way to the east coast. It is now present across North America, Europe, and Asia. The developmental stage of arthropods between each molt; in insects, the developmental stage of the larvae or nymph. When Bonnie Bucqueroux found a hard-shelled, humpback striped beetle munching its way through her potato patch, she went on a mission to learn all she could about options for controlling this pest. You can benefit from her research. Kartoffelkäfer (Leptinotarsa decemlineata) Colorado beetle Macro movie vom Schädling. 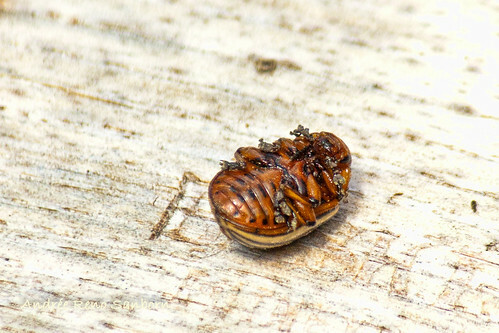 This short film introduces the Colorado Potato Beetle (Leptinotarsa decemlineata). Filmed at Grand Forks, North Dakota (03 July 2017). According to Eric Eaton and Kenn Kaufman, in their book 'Field Guide to Insects of North America,' this species "is native to Mexico, where it originally fed on burweed. As cattle were grazed further north, they spead burweed and the beetles followed, reaching Colorado about 1822. Previously, Pizarro had found the Incas cultivationg potatoes in South America and had shipped some to Spain. From there the crop made it to England and on to the states. Beetle and potato met in the midwest, the insect developing a preference for this new foodplant" (p. 160). Photographed at Grand Forks, North Dakota (18 July 2009). A Colorado potato beetle larva prefers potato leaves for its dinner, but may feed on a number of other plants in the family Solanacae.